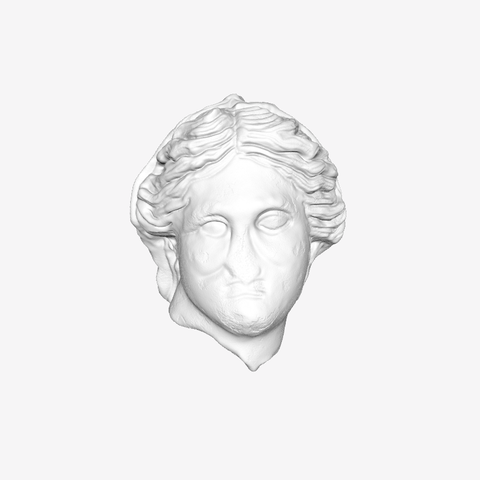 he hair on this marble bust of a woman is styled as thick curls, similar to that of a similar sculpture that can be found next to this sculpture in The Louvre (also archived on Scan The World! ), styles below a veil that is sat on the top of her head and trails behind her. it is suggested that the woman was wearing earrings due to the holes that can be seen in her earlobes. The reverse of this head is not detailed, and no body has been found which can be suggested that it was fixed onto a wall or used in a funerary home. This female head wears a veil forming a fold above the skull following a widespread pattern since the years 350 BC and whose most famous example is the Demeter of Cnidus at the British Museum, part of the Scan The World Archive. This relationship has sometimes led to believe that this was a variant head . However, briefly worked side of the work may be a sign that it belongs originally to a funeral effigy or a high relief decoration, in which it was embedded .